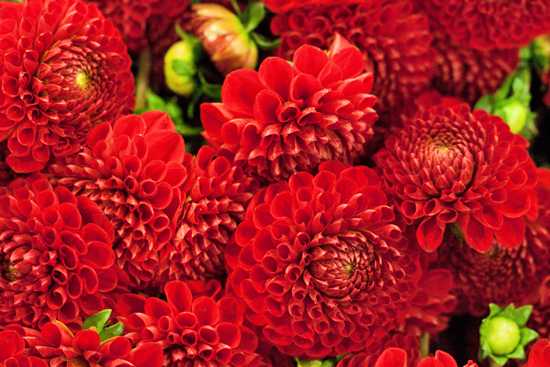 In this month's profile, we're going to take a look at a wonderful flower which is in its prime at the Market at the moment…the dahlia. Over the last few years, dahlias appear to have been enjoying a bit of a renaissance and are becoming fashionable again. 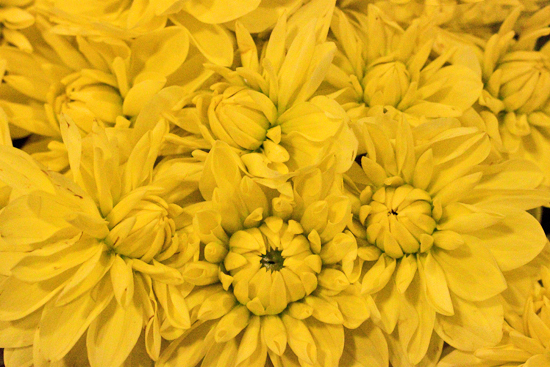 Belonging to the Asteraceae family, they get their name from the Swedish botanist, Dr. Anders Dahl. There are so many varieties in a myriad of fabulous colours, shapes and sizes, with some very tall types also available. Peak season is generally July through to October, depending on the weather. 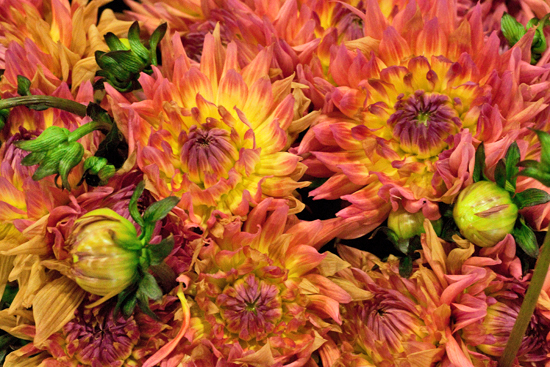 Many dahlias come from Holland, but there are also UK growers supplying the Market. 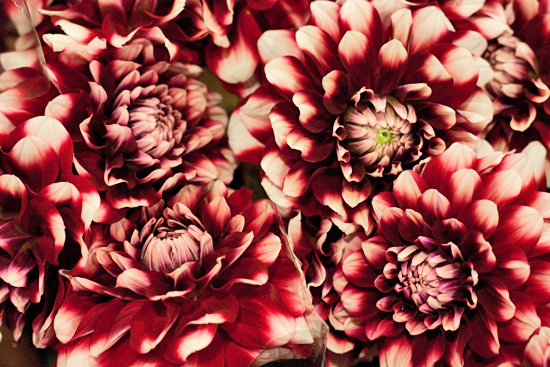 For example, you can find home-grown dahlias at Pratley, Dennis Edwards Flowers, E Four and Alagar. The dahlias featured above are beautiful British dahlias at Pratley. 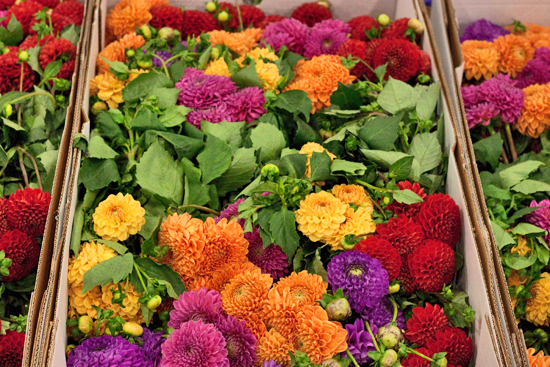 As cut flowers, they're perfect for hand-tieds and arrangements. And you'll also find them on sale as potted plants. 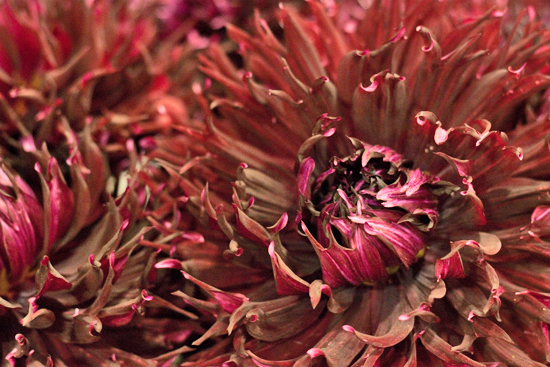 There are several types of this wonderful bloom available at New Covent Garden Flower Market. 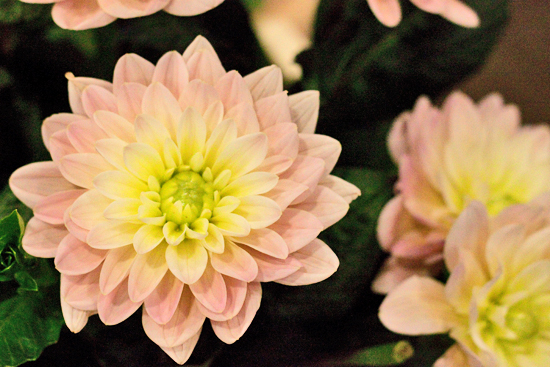 Standard or regular dahlias is the terminology that the traders tend to use when they're referring to the Decorative and Waterlily types. 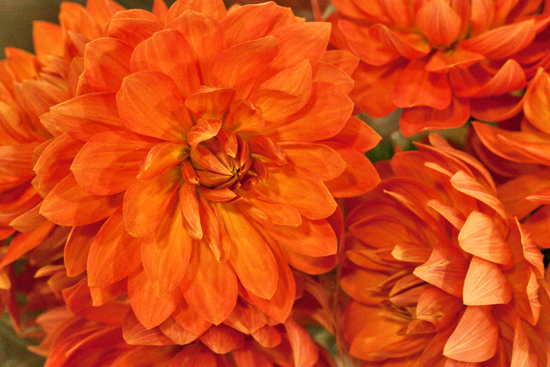 Decorative dahlias have double blooms and their petals are normally broad and flattened. 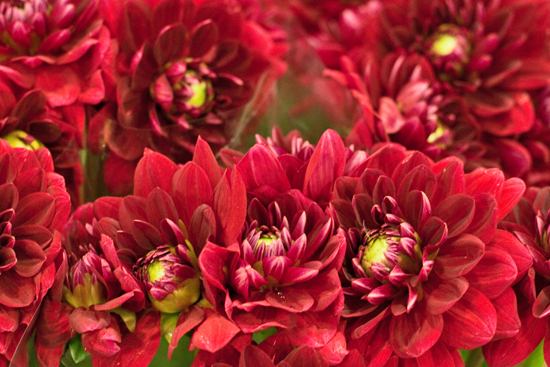 Examples of this type of dahlia are Diana's Memory (pale pink/yellow), 'Salsa'(dark red) and 'Karma Choc' (dark red to maroon). The Waterlily type also have double blooms. But their broad petals are slightly curled up along their length, giving a saucer-shaped appearance to the flower. 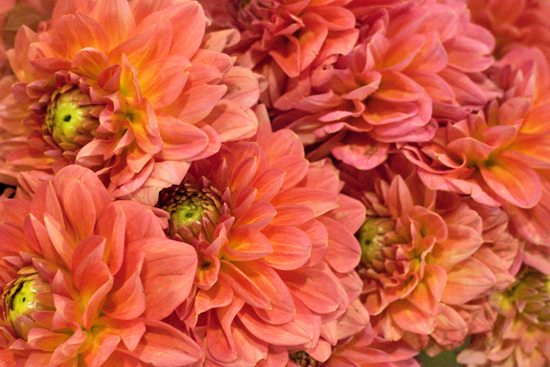 Examples of this type of dahlia are 'Gwyneth' (orange), 'Taratahi Ruby' (red), 'Glorie van Heemstede' (yellow), 'Gay Princess' (pink), 'Anna Lindh' (white), 'Carolina Wagemans' (apricot) and 'Onesta' (pink). 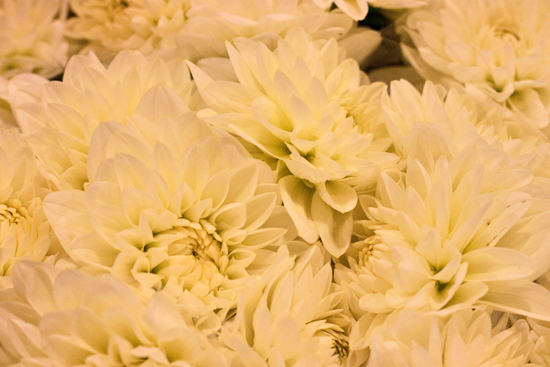 These Gwyneth dahlias immediately below are British grown and are available from Dennis Edwards Flowers. Pompons, sometimes referred to as 'Poms' by the traders, have small, compact flower heads and their petals curl up along the whole of their length. 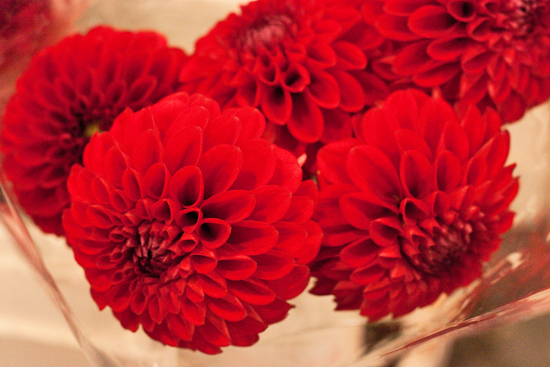 Examples of this type of dahlia are 'Viking' (red) and 'Prom' (dark red) which is pictured below. 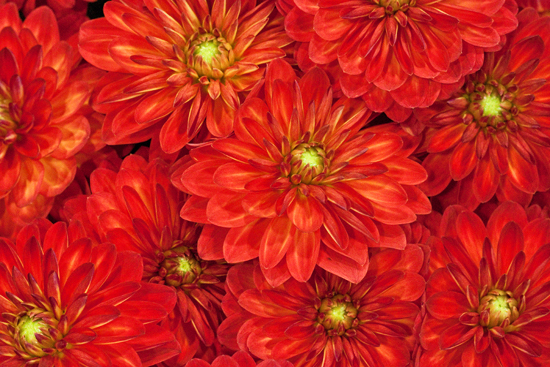 This particular variety is British grown and is available from Dennis Edwards Flowers. 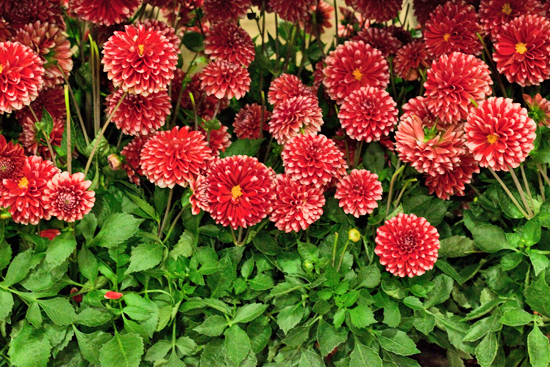 These red Pompon dahlias and the mixed box below are home-grown and are available from Pratley. 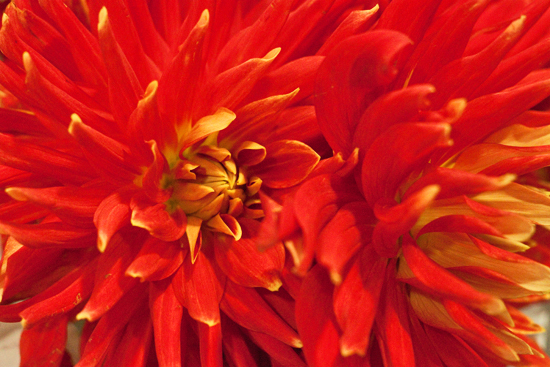 'Spikey' or 'spider' is sometimes how the traders describe the Semi Cactus and Cactus varieties of dahlia. They have narrow petals, with the Semi Cactus petal shape broadening out a little at the back of the flower. This wild-looking dahlia at Bloomfield immediately below, with its pink petals and gold highlights, is called 'Sangria'. It’s a member of the Semi Cactus group. 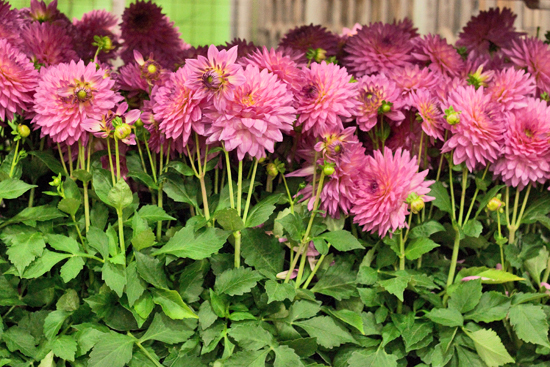 You'll also find dahlia plants at the Market, including these varieties at L. Mills. 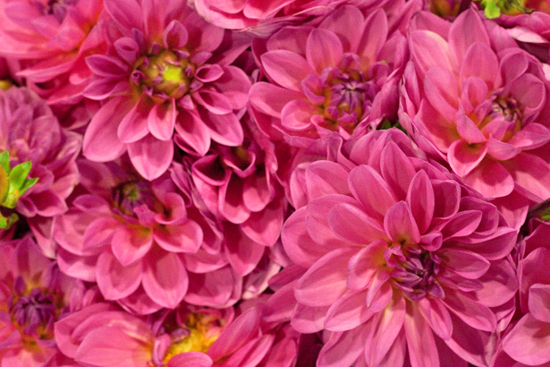 Dahlias, as cut flowers, are sold in bunches of five, or sometimes ten stems. Prices generally start at around £0.40 -£0.60 pence per stem, depending on availability and the time of year. The tall varieties usually start from £2.00 per stem. 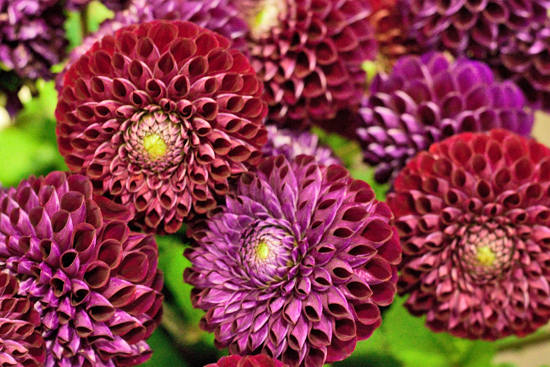 UK dahlia grower, Richard Ramsey of Withypitts Dahlias has the following advice that may help you extend the vase life of your dahlias. He says: "Place your blooms in water as soon as possible to prevent wilting. Air moves rapidly into the water-conducting tissues of the flower stems and plugs the cells. To prevent this, hold the stems underwater and trim to the length required at a 45 degree angle with a sharp knife. Cutting at an angle enables the stem to stand on a point, allowing water to be in contact with the cut surface. Cutting underwater ensures that air does not enter the stems. Never use scissors to cut the stems as they will crush the vascular system and block the water uptake. Be sure to strip any foliage that will be underwater in the vessel you will be using. Bacteria will form if foliage is in the vase water and cause premature demise of your beautiful blooms. Discard any decaying leaves or flowers because gases and bacteria form on wilted or decaying flowers. Be sure to clean the inside of the vase you will be using with a bleach solution. This process destroys any bacteria that may be present. Use fairly hot water as it will move into the flower stems more effectively than cold water (kinetic energy). Allow the vase of flowers to cool slowly, this process is called 'hardening' which ensures maximum water uptake. In this one brief period while the water is cooling, the fresh stems, leaves and flowers take up almost as much water as in the remainder of their life. The main objective in this process is to get water and nutrients as quickly as possible to the blooms. If possible, change the water daily and ensure the vase or container is cleansed of all detritus." 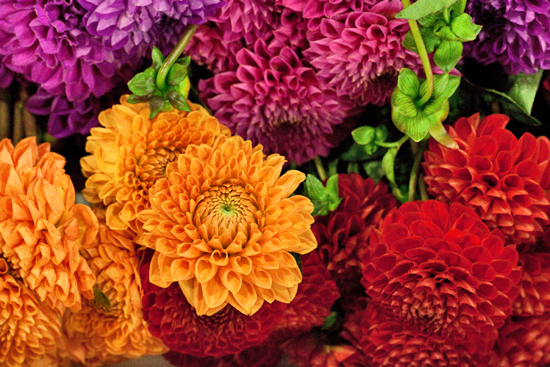 Ronny at Bloomfield says: "Take care when you're handling dahlias as if you're not careful, the flower heads are likely to shatter…especially, the Pompon variety". 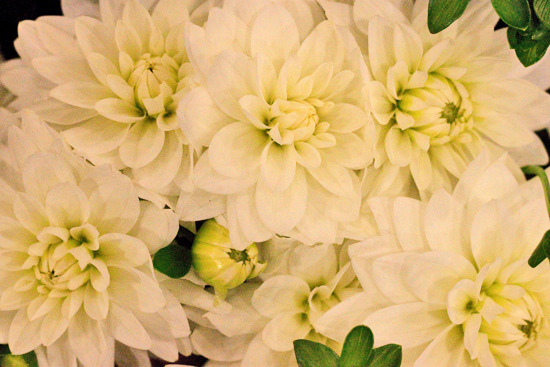 Treating your blooms gently is also what John at S Robert Allen recommends. 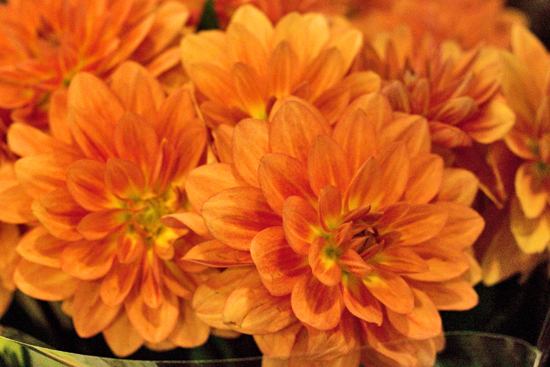 He says: "Dahlias are very delicate flowers and their petals bruise easily. The white varieties in particular need to be handled very carefully to keep their petals unblemished". 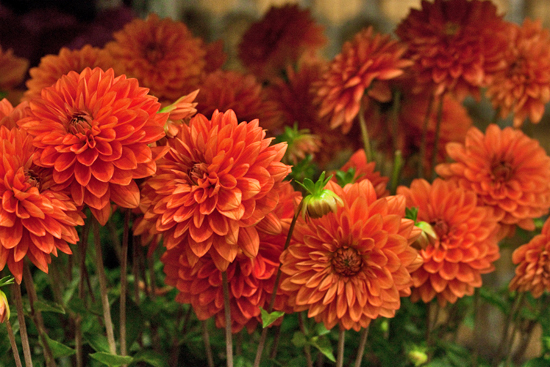 And Richie at Alagar says: "Keep your dahlias in a cool place and they’ll usually last five to seven days". So, if you'd like to buy some of these fashionable blooms, which in the Language of Flowers represent 'good taste, elegance and stability', why not visit the Market soon to see all the different varieties available?